Did 9News err in limiting its U.S. Senate debate to eight GOP candidates? 9News stated it will include any “viable” candidate in its April 5 debate, as determined by a 5-member panel of political analysts. Frank swiftly outlined how each member of the panel is connected with establishment politics. Along these lines, one detail I stumbled on is that fact that one panel member, Kelly Mahar, has close ties to former Rep. Jon Keyser, having joined with him to form “iGOP,” a “slate of young, tech savvy Republicans” who ran for Republican National Convention (RNC) delegate slots in 2012. Mahar is also a 9News commentator. Rittiman: “We selected people [for the panel] who know what it takes to mount a successful Senate campaign and see if a candidate has anything to show besides filing an FEC form. We want people on stage who have a shot of gaining access to the primary ballot, which takes some level of organized support by this point in the process. By now, when we’re this close to the state convention, the candidates should be able to point to something. Grassroots support is great. Show us the grassroots support you have. That’s fair game. Just because we have some folks who have been closer to politics and know what it takes to run a campaign involved in the selection process doesn’t mean that those people wouldn’t take it very seriously if any of the candidates were to show us some metric or measure of grassroots support. We can all recognize that when we see it. I’d again stress that we will allow any ballot-qualified candidates who haven’t dropped out to participate in our June 7 primary debate—and that we are allowing all candidates to submit up to two minutes of video to be published on 9NEWS.com and mentioned during the debate. Yesterday, 9News announced that the panel chose eight candidates to participate in the debate. Wouldn’t voters want all of them to go at each other? Ideally yes, but there are limits. What would all those Republican presidential candidates have looked like on the same stage, with no B-Team debate to siphon some of them off? Pretty bad. A over-crowded debate doesn’t serve the public interest. Colorado faces a similar situation. So 9News did the right thing to limit the number of candidates, and a “viability” standard, in the absence of polling, makes sense. You can argue that television station should have put some non-establisment folks on the selection panel — like former Rep. Tom Tancredo, former GOP Chair and KLZ talk-show host Steve Curtis, or Tea Party leader and lawyer Randy Corporon. Some people like that, with political experience. But I don’t think it mattered. Judging from the candidates selected (see below) yesterday, 9News struck a balance between the voters’ need to hear from 1) candidates who have a demonstrable hope of winning and 2) from the underdog candidates who deserve to be heard. It’s a tough call when you have so many odd candidates vying against each other. “The lineup for the debate is not yet final. Campaigns who were not invited have been given a deadline of March 31 to provide any additional evidence of viability for the panel to consider. The panel unanimously decided that the campaigns of Charlie Ehler, Jerry Eller, Michael Kinlaw, and Donald Rosier did not demonstrate a viable path to accessing the June primary ballot. Ehler and Rosier did not provide materials for the panel to review by the Monday deadline. If you follow my blog, you know I’ve been pointing out how Republicans are falsely blaming Colorado budget problems on healthcare costs for the elderly, disabled, and other poor people. What’s worse, after scapegoating Medicaid spending on healthcare for the poor, Republicans haven’t said how they’d cut it. Or do something else to ease the budget pressure. And reporters are letting them slide. But one state Republican recently said she’s ready to cut Medicaid. That’s State Sen. Laura Woods of Westminster. During a radio interview in January, Woods said Medicaid used to be “for the truly needy,” but it’s not anymore. So she wants families to be poorer to qualify for Medicaid. Currently, a family of four qualifies if it earns less than around $34,000 per year–or 138 percent of the federal poverty level. Woods agreed with KNUS 710-AM radio hosts, who suggested reducing the earnings threshold for qualifying for Medicaid. Host Chuck Bonniwell: Well, you can change the 137 percent back to 100 percent [of the federal poverty level], I suppose. Co-Host Julie Hayden: Right. I mean, it can’t stay the way it is, right? It’s a “very difficult thing to do,” said Woods. It’s unclear whether Woods, who doesn’t return my calls, was thinking it would be tough politically to cut Medicaid or humanity-wise. The Christmas line, popular among conservatives discussing government excess, usually signals their belief that the poor are exploiting safety-net programs. So next time Republicans are bashing Medicaid, but they aren’t saying what part of Medicaid they want to cut, reporters can turn to Woods. Hopefully, she’ll have her facts that allegedly support her opinion straightened out by then. WOODS: Medicaid started out where a family of four making $20,000 a year — there’s no way they could afford healthcare. And that’s what Medicaid was for. It was for the truly needy. But when we’ve raised the poverty level so that 137 percent of the federal poverty level, I think now families of four that make somewhere between $70,000 and $90,000 a year qualify for Medicaid. WOODS: So you look around and you say, — exactly your question: “Why is anybody uninsured under Obamacare? And yet we’ve got this this driver of our state budget pushing our budget over a cliff, and it’s simply not sustainable. BONNIWELL: Well, you can change the 137% back to 100%, I suppose. HAYDEN: Right. I mean, it can’t stay the way it is, right? HAYDEN: You know, because I think what we saw– and maybe I’m wrong, but this whole – Connect for Colorado, when that major insurer just went, like, bankrupt and dropped all of those people, from what I gather only a fraction of those people actually signed up the new health care because it’s such a disaster. It’s it’s so expensive. So, am I right, then? Then all of those people – they’re going to go back in to the Medicaid, right? HAYDEN: S0, it’s going to get even worse. HAYDEN: But, I would say, that you want to be careful because you’re right – you don’t want to hurt families. If a family is making $90,000 a year, there’s a good chance that they probably have some other way to get insurance rather than free from the rest of us. WOODS: You know, I agree with that. And I think that even if it’s not $90,000. You know, $50,000 a year, you can afford something on –. BONNIWELL: Well Obamacare gives you subsidies. HAYDEN: Right! Exactly! I mean, you have the whole–. WOODS: At that level, right. Obamacare would give you subsidies. HAYDEN: And you can’t be – so, then the other thing is when the governor and all that group that’s going– that’s pushed by the Denver Post – going around trying to convince people to get rid of TABOR, which isn’t going very well, I don’t think. BONNIWELL: I haven’t heard much from them. I want to ask Laura Woods about that. I mean, you know, we heard Dan Ritchie, who is, you know The Denver Post’s favorite Republican because he is not really a Republican and therefore you can – he can front whatever left wing agenda they’ve got going, around on a listening tour, and they picled that out from my guess, probably […]–what’s her name? The famous listening tour lady. But once you go, you know, you already know what you want, and you go on a listening tour and, “Hey! They want exactly what we wanted!” But what has happened to those guys? WOODS: –to further fund our programs because there aren’t general fund dollars to do that. WOODS: I think, you know, TABOR is the one piece of legislation that Colorado can lean on and depend on and stand behind as a bulwark to prevent us from becoming what California has become. WOODS: And the conservatives in our state get that. And you know, I battle this every at every town hall I go to, every meet-and-that greet I go to where I’ve got one of my counterparts from the other side of the aisle on the stage with me and we’re back and forth over, you know, I’m standing to defend Tabor – they’re just saying we have just got to get rid of Tabor. So, it comes up. We had Andy Kerr, the senator from Littleton –or Lakewood–try to sue the state over TABOR to say is unconstitutional. That lawsuit was thrown out. So, –. HAYDEN: […] Chuck and I talk all the time about ways to generate more revenue, but in the meantime, we’re stuck with the budget that we have. And–. WOODS: Well, that’s what businesses and families are faced with right now. HAYDEN: Exactly! And the government should do the same thing. The Colorado Republican Party will post on its website the names of all the GOP activists who are running to be Colorado delegates at July’s Republican National Convention in Cleveland. The public list could set off a furious effort among the remaining presidential candidates to either get their supporters elected as national delegates or win over the unbound candidates vying to be delegates to get their votes later. Under Colorado GOP Party rules, Republicans who are running for one of the Colorado GOP’s 34 national delegate slots have the option of binding themselves to a specific presidential candidate, like Donald Trump. Or they can run “unbound” to a candidate, leaving themselves free to vote for any candidate during the first vote at the GOP National convention. They make their choice known to the Colorado Republican Party on a form, titled “National Delegate Intent to Run Form,” that must be submitted 13 days prior to the April 9 Republican State Convention or the April 8 Congressional District Convention, where delegates are selected for the national Republican Convention. Delegates to those meetings are chosen from county and congressional district assemblies. Colorado Republicans eliminated their preference poll at their March 1 caucuses, so reporters have been unable to get a handle on how the state GOP will allocate its delegates. Some caucuses held nonbinding votes anyway, raising the possibility that national delegates who voted in straw polls may be bound to their straw-poll votes, per national GOP rules. Colorado Republicans get 34 elected national-delegate spots. Three additional Colorado delegates are determined by the Republican National Committee. By rule, those three delegates are specificied to be the State GOP Chairman (House), the RNC Commmitteeman for Colorado (George Leing), and the RNC Committeewoman for Colorado (Lilly Nunez). After the first vote at the GOP National Convention, all of Colorado’s delegates will become unbound and free to vote any candidate, according to House, who appeared on KLZ’s “Americhicks” show. Steve House himself is going to the convention as an unbound delegate, and he’s likely to vote for one of the candidates who are in the race now, according to The Hill’s Jonathan Easley and Ben Kamisar. House said that even if one of the candidates arrives with a strong plurality of delegates, he wouldn’t feel obligated to push that candidate across the finish line solely by virtue of them coming the closest. 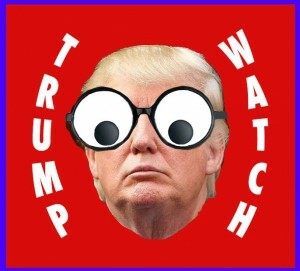 House also said he will likely only support a candidate who is still running for president, rather than a “white knight” candidate, like Mitt Romney or [Paul] Ryan, who could be put forward in later ballots. “I’ve received hundreds of emails, and I’m getting phone calls from people telling me who they think should be president and why,” said Steve House, the chairman of the Republican Party in Colorado and an unbound delegate. KLZ’s afternoon host David Muerer didn’t vomit, gasp at this, or lose his voice, or anything. When he responded to David, Muerer seemed to be hustling toward a commercial break, so I asked him if he really agreed with caller David’s bigotry. “As far as the conversation with (Caller) David goes whether he’s a bigot or a man simply stating his fear I have no way of knowing. However, a good argument can be made for everything he is stating in his comments,” Muerer told me via email, inviting me to discuss the topic or any topic on his show. Muerer went on in his email to partially contradict himself, saying there are “good patriotic American Muslims.” This despite the textbook bigoted believe that a certain religion should not be allowed in our country. Muerer’s own inconsistency reflects what you find a lot on talk radio: bigotry manifested more as an amorphous reaction than a concrete thought. But the amorphous bigotry can be focused into a dangerous force by the right fascist. Partial transcript of KLZ host Dan Muerer’s conversation with “Caller David” on Friday, March 11. CALLER DAVID: Eloi. There is there something called that in one of those science-fiction–. Somebody used to write about that, how those –. MUERER: I’m not familiar with that. CALLER DAVID: Yeah, Eloi. Yeah, they’re the people that just sort of like go along, like you say, like zombies, and that’s what the non-Muslims who are going along with the Muslim invasion of the West are. They just go along with the program and unfortunately they just don’t even have the sense to realize that it’s not them– it’s not this people living now, [they] are not the ones that are really going to suffer. It’s 50 years from now, when Islam has really taken hold and they’re going to look back at our generation, people who were alive during 9/11, and they are going to curse us to hell, if they have the sense even then to see what has happened to them and they’ll realize that we still had a chance to stop it. And we didn’t. Because everybody was afraid to be called a bad name. CALLER DAVID: Oh, I know it! MUERER: –about that even the road signs now are in both German and Arabic. Uh, you know, you see what’s going on France. You see sharia law zones in Great Britain. You see what’s happening in Dearborn, Michigan. You know, and for me, coming from Minneapolis — to see what’s happening in south Minneapolis, in the southern suburbs. MUERER: It’s a cultural change. We reported earlier this week — or maybe it was last week – that, you know, there’s scheduled that 1600 of the Syrian refugees are due here in Denver. So, you know, it is a problem. And I really–. CALLER DAVID: And, like one out of 1000 of them are Christian. It’s all Muslims they’re bringing in. MUERER: No, none of these are Christians, as far as I know. These are all Islam – as a matter of fact, the Christians are having one heck of a time getting out of there. Our State Department is not letting the Christians in. I would say for every hundred thousand Islam or Muslims they let in, they might let in one Christian right now. Now, they may be opening that up a little bit because there’s been a lot of pressure applied, but in the middle of last year they were not allowing any of the Christians in the persecuted Christians into the United States. CALLER DAVID: They – they — I mean, I don’t know – I’ll say it. I guess people can start mulling it over in their mind and coming to grips with it in their own way. But the only way that America can survive long term is to not have Islam within our borders. If you have any amount of Islam, even if it’s 1 million or 2 million or 3 million, it will only grow because people are born into Islam and they can’t leave Islam. There’s a death penalty for leaving Islam. So whether it takes 100 years or 500 years, eventually that number will grow big enough that they will just vote out the Constitution. MUERER: That – you know, that is really a possibility because, you know, like others have said: you can’t beat a birthrate. And I just don’t think we’re converting them to our side good enough. David, I really appreciate the call. Thank you so much! Woods joins Trump and Coffman in opposing citizenship for undocumented immigrants born in the U.S. 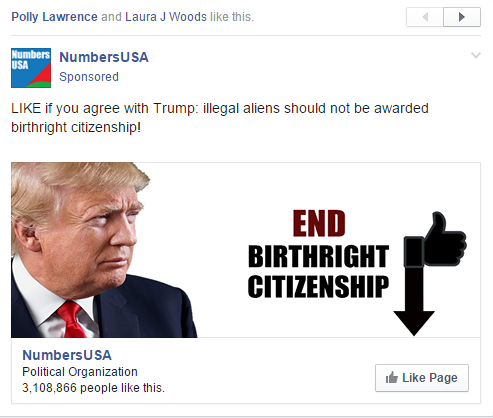 In a Facebook post last week, State Sen. Laura Woods (R-Westminster) came out against birthright citizenship, the U.S. policy granting citizenship to people born on American soil, even if their parents are not citizens. The debate about birthright citizen was largely confined to hard-right conservative circles, until Donald Trump came out against it in August, as part of his immigration platform, sparking high-profile debate among Republican presidential candidates and pundits. LIKE if you agree with Trump. Illegal aliens should not be awarded birthright citizenship! Trump’s immigration platform also calls for the rounding up and deportation of America’s estimated 11 million undocumented immigrants to their country of origin. From there, they’d be free to apply to become U.S. citizens. Woods’ office did not immediately return a call for comment on whether she agrees with Trump’s immigration policy in its entirety–or whether she’d want to rescind citizenship from millions of immigratns who’ve become U.S. citizens under America’s birthright-citizenship law. Most other Colorado politicians have been silent on birthright citizenship, but as recently as 2013, Rep. Mike Coffman confirmed his opposition to the policy, in an interview with The Denver Post, saying “sure” he’d like to abolish birthright citizenship. Back in 2011, Coffman cosponsored a bill that would have abolished birthright citizenship. Both Woods and Coffman represent swing districts where anti-immigration positions could turn off immigrant voters. About 20 percent of Coffman’s district is Latino. Woods won her Westminster seat by about 650 votes in 2014, while Coffman has been seen as vulnerable since his district was re-drawn after the 2010 census. Coffman narrowly defeated a Democrat in 2012 and won by a larger margin in 2014. Republican U.S. Senate candidate Jack Graham, who’s the former Athletic Director at Colorado State University, appeared on KNUS 710-AM Saturday, spreading uncorrected falsehoods about marijuana and Islam. During a segment on policy issues, KNUS host Craig Silverman asked Graham about Amendment 64–but he failed to correct Graham’s obviously incorrect answers. Graham: I’m very very concerned about it. I don’t like the fact that the state of Colorado is standing out like a sore thumb, as functionally the only state in the country that’s legalized recreational marijuana. We have attracted lots of vagrants to our state. There are lots of crime issues associated with that. Marijuana is not a consequence-free drug. I’m concerned about it. At the same time, there is a grassroots movement to legalize marijuana across this country. I just don’t like the state of Colorado sticking out the way it’s sticking out. In fact, pot is currently available for recreational use in the states of Washington and Oregon. Alaska and the District of Columbia have also legalized it, as well as some municipalities. More are expected to approve it in the coming years. I also can’t find data supprting the view that pot attracts vagrants to Colorado. And while there are crime issues associated with pot, the crime rate has not increased. This again, is incorrect. Colorado lawmakers on both sides of the aisle have been trying to move legislation through Congress, allowing the marijuana industry to conduct banking operations without fear of federal prosecution. The U.S. Senate could vote on bills such as this. This is inaccurate. In fact, less than one percent of the world’s Muslims are at risk of becoming radicalized, according to one 2015 intelligence estimate–and the key phrase there is “at risk.” They aren’t all doing awful things. A tiny minority. On abortion, Graham said the government shouldn’t fund “morning-after pills.” He did not say whether he’d want the government to supply such pills to women who’ve been raped. Graham, who hopes to take on Democrat Michael Bennet, told Silverman that his anger over the U.S. nuclear deal with Iran drove him to enter the race. With Trump’s wins last night, the question of whether Colorado Republicans will vote for the mogul, if he’s the nominee, became even more relevant, as we inch toward the Republican Party’s July 18 national convention in Cleveland. Here’s an update of my handy TrumpWatch guide for reporters tracking the local GOP response to Trump. The mogul still apparently has only one GOP elected official who, based on public statements, affirmatively likes him and would vote for him as nominee. That’s State Sen. Laura Woods, the Republican from Westminster (though her candidate-of-choice is Ted Cruz). You recall, Woods “narrowed” her choices to Cruz and Trump after the GOP debate in Boulder. Still, as you can see below, I can only find a couple former or current Republican elected officials or candidates who will say, flat out, that they won’t support Trump. A larger number of prominent Republicans have said they’ll back Trump as nominee. State House Minority Leader Brian DelGrosso. State Sen. Laura Woods has said Trump is one of her two favorite prez candidates (here at 25 min 50 sec), but she’s backing Cruz. Elected Officials Who Will Back Trump, if He’s the Nominee. Former State Rep. Spencer Swalm is an “out-of-the-closet” endorser. These GOP U.S. Senate candidates told the Statesman they’d back Trump as nominee: businessman Robert Blaha, activist Charlie Ehler, Ryan Frazier, El Paso County Commissioner Darryl Glenn, former CSU athletics director Jack Graham, former Rep. Jon Keyser, El Paso County Commissioner Peg Littleton, and State Sen. Tim Neville. Casper Stockham, who’s challenging U.S. Rep. Diana DeGette, says he will vote for Trump if he’s the nominee. Please send me any additions to this list. Denver Post editor Greg Moore’s resignation today is probably yet another depressing sign that the newspaper faces serious troubles and decline. If things had been going well, or even stabalizing, at The Post, which faces a broken business model, Moore wouldn’t be walking away–unless there’s some personal reasons that aren’t widely known right now. It sounds like more cuts are on the way. The unprecedented budget cuts, layoffs, and other shrinkage and reductions have to take an incredible toll on the guy at the top, no matter how thick-skinned. That’s not what Moore had to say in his resignation statement, as quoted in The Post, but I don’t see much optimism floating up between the lines. Publisher Mac Tully said a national search for Moore’s replacement will begin soon. In the interim, news director Lee Ann Colacioppo will lead the newsrooom. She also is a candidate for the job. Moore has his detractors, but, bottom-line, the newspaper under his leadership still managed to still produce quality journalism, despite the industry decline. Of course, it could be better. But you can bet we’ll miss today’s Denver Post next year, when things will likely be worse. The latest Republican to stand in front of a camera and complain about state spending on health care for the elderly, disabled, and other poor people, without offering any alternatives, is former state Sen. Greg Brophy, who’s freshly back from a job with Rep. Ken Buck in Washington DC. Brophy appeared on Politics Unplugged, 7News’ interview show, last month to say that Colorado is being forced, under TABOR rules, to refund taxes to citizens due to the hospital provider fee. “The hospital provider fee and the other expansions of, well, it amounts to Obamacare, have committed spending on that area at the expense of every other area in state government,” said Brophy. In 2009, Colorado tapped federal funds, used to match a “hospital provider fee” collected by hospitals, to expand Medicaid coverage to around 300,000 low-income people and children. It allowed kids, for example, from families of four making $45,000 annually to qualify for state Medicaid coverage. Later, Obamacare kicked in, reimbursing the state to cover more poor people in Colorado. So yes, Colorado has expanded its Medicaid program. It’s one of the major functions of the state government, along with k-12 education, higher education, transportation, and prisons. So, reporters should ask how he wants to cut Medicaid. Knock off some of the disabled people? Keep in mind that the state isn’t paying for coverage of the newly added people anyway, since the feds pick up the tab for Obamacare and the hospital provider fee. So what would Brophy have us do? Charge poor people co-pays, which Brophy advocated in the past, saying poor people aready spend their money on, Lotto, cigarettes, and air conditioning? Would he have Colorado lower eligibility thresholds? Are we too generous? Brophy didn’t return a call to explain. “I really think we want to force the state of Colorado to find efficiencies in what they spend money on,” Brophy told 7News’ Marshall Zellinger, sounding a lot like Donald Trump. Where are these efficiencies? Where’s reality? Or is it like, I’ll force Mexico to build the wall. Trust me, they will. You are currently browsing the The Big Media Blog weblog archives for March, 2016.